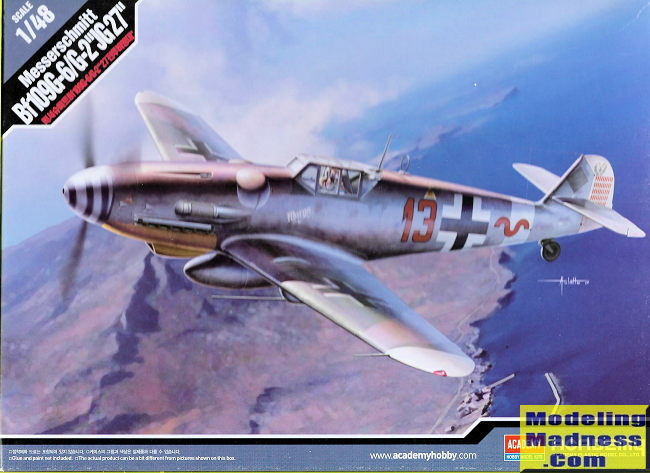 Academy 1:48 Messerschmitt Bf 109G-2/G-6 "JG27"
The Messerschmitt Bf 109 is, together with the P-51 Mustang and Spitfire, one of the most recognised fighters of all time. First flown in 1935 and entering operational service with the Condor Legion in the Spanish Civil War in 1937, over 33000 airframes were manufactured in the 10 years it saw combat, making this aircaft one of the most produced fighters in history. It was operated by 15 countries and was produced in numerous variants and sub-variants. The Bf 109G was the most produced variant of the Bf 109. It was fitted with a Daimler Benz DB 605 engine with an output of 1475hp. The Bf 109G-1 version was equipped with the DB 605A-1 engine of 1475hp, a GM-1 injector and a pressurised cockpit. The Bf 109G-2 was similar to the G-1, but without the pressurised cockpit. The Bf 109G-6 was the most important version of the Gustav, and the most produced too. It could be powered by a DB 605AM, AS or ASM engine. It was armed with two MG 131 13mm machineguns in the nose and one MG 151 20mm cannon firing through the nose cone. The G-6/U4 carried a single MK 108 30mm cannon firing through the nose cone, and the G-6/R6 variant carried the standard armament of a regular G-6, plus two MG 151 20mm machineguns on two underwing hardpoints, giving the aircraft the name of "Kanonenvogel." Academy´s kit (with Hobbycraft plastic) comes in a top opening box with a really nice artwork of Heinrich Bartels´s Bf 109G-6/R6 overflying Greece´s landscape. The kit has 91 pieces, 86 being moulded in shiny light grey plastic, the other 5 being the clear parts. All the parts are crisply done and don´t have any flash and have recessed panel lines. 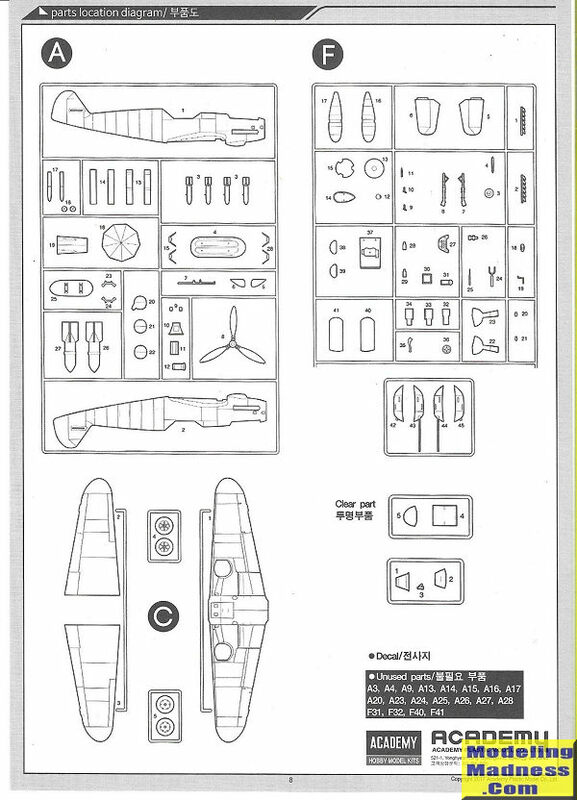 Since Hobbycraft were known to make multiple boxings of the Bf 109, you get some spare parts, such as 4x50kg bombs and their rack, 1x250kg bomb and its rack, two underwing WGr 21cm mortars, an umbrella for the desert, and the larger wing covers for the later G-10/K versions, that allowed for the installation of bigger wheels. Instructions come in two booklets. 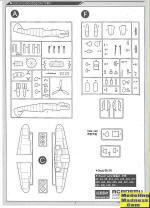 The first one is dedicated entirely to the assembly of the kit, which has 10 steps, each step labelled with numbers to tell you which parts go where so you can build your desired version of the G-2/G-6. The second booklet was produced exclusively for the decalling of the model. Both booklets are in black and white. 1) Bf 109G-6/R6/Trop Red 13 "Marga", flown by Heinrich Bartels. Painted in RLM 74/75/76 with light mottling, a yellow lower cowling, white rudder, wingtips and fuselage band, and with a sawtoothed camouflage over the wings. 11/JG 27, Kalamaki, Greece, November 1943. 2) Bf 109G-6/R3/R6/Trop "Black Chevrons and Bars", flown by Gerhard Michalski. Painted in RLM 74/75/76 with heavy mottling, a yellow lower cowling and a white fuselage band. The wings are painted with a wavy camouflage. II/JG 53, Comiso, Italy, July 1943. 3) Bf 109G-6/R3/R6/Trop "Yellow 7 and Bars." Painted in RLM 74/75/76 with a yellow lower cowling and white fuselage band. It has a high fuselage demarcation line. No mottling, but large blotches of RLM 74 painted to the sides. Soft edged camouflage in the wings. 6/JG 53, Comiso, Italy, July 1943. 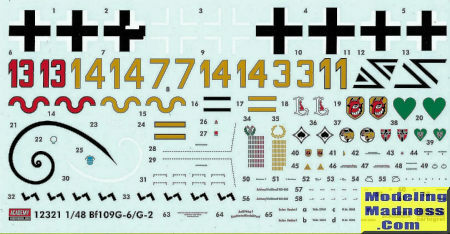 4) Bf 109G-6/R3/R6/Trop "Yellow 14 and Bars." Painted in RLM 74/75/76 with yellow lower cowling and a white fuselage band. Modereate mottling and large patches of RLM 74 under the "14." Wings painted with a sawtoothed camouflage. 6/JG 53, Comiso, Italy, July 1943. 5) Bf 109G-2/Trop (no tactical markings). Last aircraft of Hans Joachim Marseille. Painted in RLM 78/78 with yellow lower cowling, spinner, fuselage band and lower wingtips. 3/JG 27, North Africa, 30 September 1942 (date of Marseille´s death). 6) Same as 5), but this time the aircraft is marked with a "Yellow 14," has JG 27´s emblem on its nose and Marseille´s tally on the rudder. Probably the correct version of this painting scheme, since Marseille´s article on Wikipedia mentions the cockpit of his Bf 109G-2/Trop "Yellow 14" began to be filled with smoke. 7) Bf 109G-2/Trop "Black Chevron," flown by Heinz-Edgar Berres. Painted in RLM 78/79/80, with a yellow lower cowling and a white fuselage band. The wings and fuselage are covered with large splotches of RLM 80. 8) Bf 109G-2 "Yellow 3," flown by Wilhelm Schilling. Pinted in RLM 70/71/76 with a yellow lower cowling and a yellow fuselage band. Wings are painted with a wavy/soft edged camouflage. 9/JG 54, Dubrovka, Russia, September 1942. 9) Bf 109G-6/R6 "Yellow 1 and Bars," flown by Wilhelm Schilling. Pinted in RLM 74/75/76 with a lower cowling in yellow and a blue Reich Defense band on the fuselage. Moderate mottling. The wings are painted with a soft edged camouflage. All the fuselage bands have to be painted, none come as decals. You will probably find this kit in the US/Europe for less than 35U$D/30 Euros, but with the current exchange rate of 1ARS=40U$D, this kit seemed really cheap (and I bought it before the price was changed). If you take into account how well moulded the kit is, the 9 decal options of a sheet printed by Cartograf, and the amount of spare parts you get in the box, I´d say this kit is an absolute deal for your money. I´ll be painting this model as Marseille´s aircraft, my shelf is covered with RLM 74/75/76.